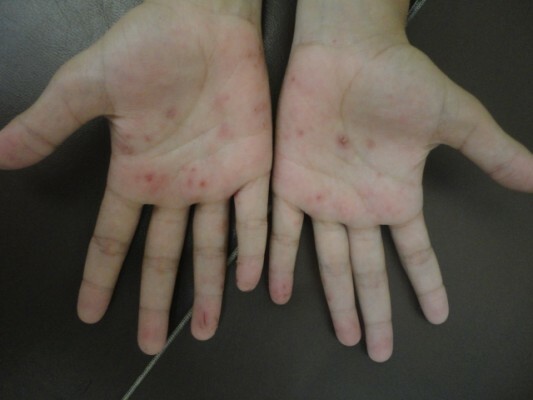 Background: Previously known as dyshidrosis, recurrent vesicular palmoplantar dermatitis (RVPD) is presented as severe eruption of nonerythematous, symmetrical vesicles or bullae located along the lateral sides of fingers, on the palmar or plantar areas, and developing into a chronic and recurrent condition. Although very frequently observed on the hands, there are no specific studies about such eczema in children and adolescents. Objectives: To report on the RVPD clinical profile in children and adolescents, and monitor the association of RVPD with seasonal variations, hyperhidrosis, atopy and nickel sulfate. Materials and methods: Eighteen patients affected by RVPD were submitted to clinical and laboratory assessment through anamnesis, physical exam, mycological exam, patch test, complete blood count and serum IgE levels. Results: Seven patients (38.9%) reported increased frequency of eruptions during the summer months; 12 patients (66.7%) presented hyperhidrosis; in 14 cases (77.8%), atopic factors were determined; reaction to nickel sulfate was positive in three patients (16.7%). Conclusion: RVPD onset may occur at an early age, developing into a chronic and recurrent infection. Hyperhidrosis and atopic status was established in the clinical profile and no connection between nickel sulfate and RVPD was observed.